This was another great Nomadic Notions class taught by Mick Mcnulty. 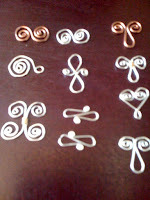 I learned how to shape wire into fun shapes to use in jewelry that can be used either as links or as focal points or even as charms or clasps. Spirals. S-shapes. Hearts. U-shapes. X-shapes. Even figure eights! Much fun. Haven't used these to create a piece yet, but I hope to someday soon.